Induction technology has been used in professional kitchens for over 40 years, but is relatively new to the domestic scene and is mainly found in the built-in market. The first brand to introduce induction to a range cooker was Stoves, who launched their Sterling 1100E model in 2007. Induction cooking is still something of a mystery to many consumers, but the advantages are manifest, and new users of induction hobs will wonder how they ever coped with anything else. A powerful electro-magnet below the hob's glass surface acts directly on the molecules of the ferrous material in the pan above, exciting them to the point where heat is produced. Because the rate of excitement can be directly controlled by the electrical flow to the magnet, the effect of any adjustment is immediate. • Auto Heat-up function - powers up to maximum before automatically reducing to a given setting. • Power Boost - when needed, power is drawn to a single zone for extra intensity. Great for wok cooking. Another benefit of induction is that because the heat is distributed evenly throughout the pan you are far less likely to burn the contents, and there is less need to stir to spread the heat evenly! Induction is considered to be 25% more energy efficient than ceramic heat sources and 30% more than gas. Induction zones are faster and more energy-efficient than radiant ceramic zones because the induction technology uses only enough energy to heat a particular pan, rather than heating up an element, the glass surface and then the pan, so any heat-loss is minimal. Induction hobs will often feature touch controls, and all will have a digital power-level display. The touch controls are discreetly positioned on the surface of the hob itself, removing the need for additional control knobs on the front of the cooker, although most range cookers retain these. • Timers are often featured, allowing you to set simmering times to avoid boiling dry. • Pause function - if the doorbell goes, just pause then go back to where you were. • Recall function - saves your last setting, so you can repeat a favourite process. • Auto switch-off - pre-set the switch off time for peace of mind and convenience. • Keep-warm function - a slow trickle of power which is just right for delicate sauces, melting chocolate, etc. • Griddle zone - pairs-up two adjacent zones for use with a large griddle pan or fish kettle. • Child safety locks, which invariably feature as standard. • Safety shutdown - if unattended for a long period all zones are automatically switched off. 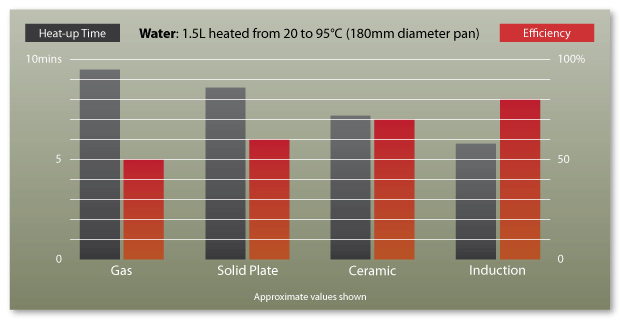 • Pan overheat sensors - if anything boils dry, the zone will automatically switch off. With just a smooth glass surface to wipe over, and no burnt-on spillages, induction hobs are a breeze to clean. Will I Need New Pans for Induction? Stainless Steel - Unless they have been made especially, with a steel plate embedded in the base, normal stainless steel pans may not work well with induction, as the ferrous content is relatively low. Enamelled Steel - Pans in enamelled steel, with or without non-stick coating, will work very well. Cast Iron - Great with induction, but to avoid the risk of scratching the glass top of your hob use pans with an enamelled base, or avoid sliding the pan across the glass surface. Enhanced Aluminium Pans - Aluminium is a great conducting material, but you will need induction-suitable pans with a thick base, as this ensures more even cooking. Incompatible Cookware - Glass, ceramic or earthenware pans, aluminium pans (unless they have a special base), copper pans.